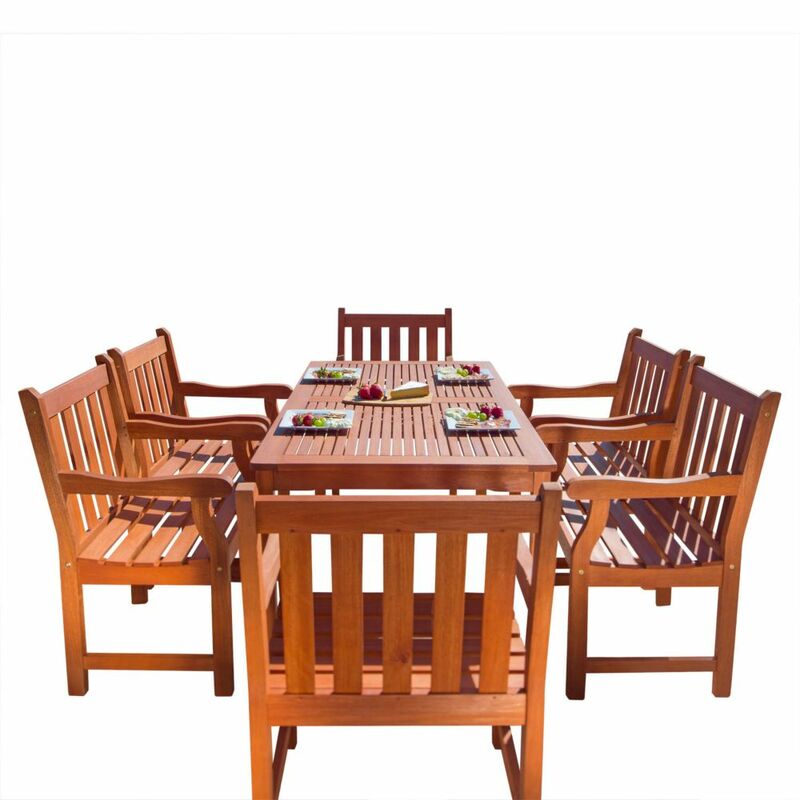 Malibu Patio 7-piece Wood Dining Set V98SET26 Make way for dinner parties, idle summer cocktails, and the optimization of fresh breezes to come with this Malibu Outdoor Patio 7-piece Wood Dining Set! Made from 100% Eucalyptus - a very durable Hardwood, this set that can stand up to all kinds of changes in the weather. The pores of the Eucalyptus is very dense; thereby it quickly repels water, and its natural oil combats and repels wood eating insects. Comes in the beautiful Natural Wood Finish, this set will be a great addition to your outdoor patio! Malibu Patio 7-piece Wood Dining Set V98SET26 is rated 4.5 out of 5 by 2. Rated 4 out of 5 by NorCalConsumer from Looks as pictured Just assembled this set this week so it's too early to tell how well it will withstand outdoor weather conditions. It looks just as good as in the picture as received. It was simple to assemble but would have been much more difficult without a power drill that had an allen wrench adapter. There are a lot of big screws to assemble all 8 chairs, and tightening them with the supplied little allen wrenches would have been difficult. Two points: 1) The specification details for this set say the chairs are folding - they are not. 2) Specifcations also say there is no umbrella hole, but there indeed is a center hole in the table for an umbrella.